The doorbell rang at about 8:30 yesterday morning. From the side light windows I could see a man and woman standing at the front door. We were expecting them. Well, I should say we were expecting someone to come to install our new bedroom carpet. We opened the door and the man said, “Carpet”. The two of them quickly came into the house and immediately headed for the bedroom. They knew the layout of the house, they said. “Two more out in the car,” she called over her shoulder. The other two were a young woman and a young man. They looked to be in their early 20’s. They came in carrying what I assumed was carpet installation paraphernalia. Huh! I thought we had done a pretty good job of emptying out the bedroom. 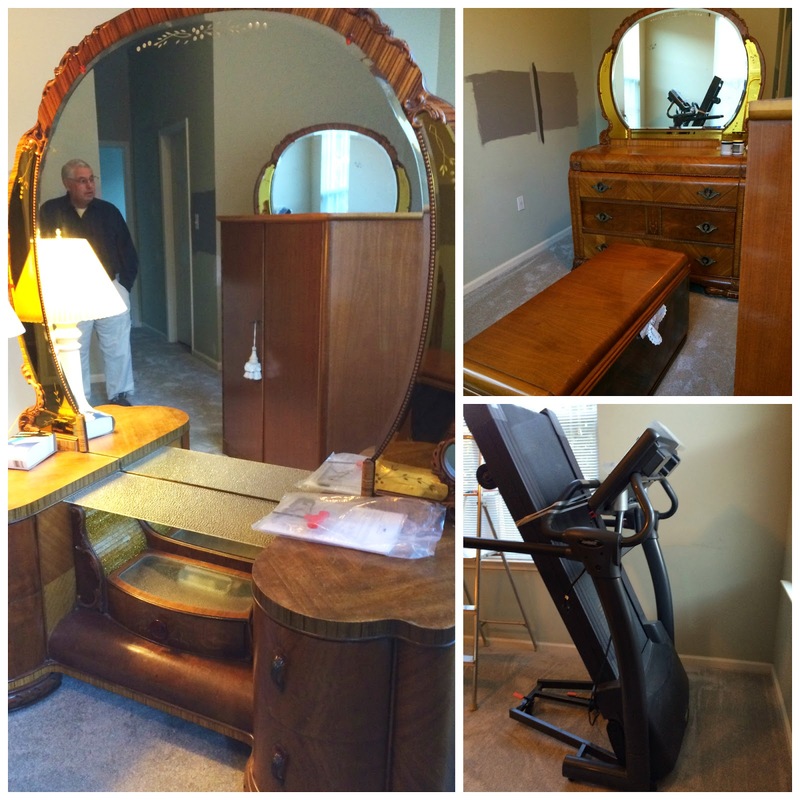 All that was left was the heaviest treadmill in the world, the biggest 1930’s depression era vanity (which includes the largest vanity mirror in the world), a huge matching 1930’s dresser (which includes the world’s second largest mirror) and a chifforobe. Oh, yeah and a queen size bed. The first thing that struck me was how quickly each of them moved. Their pace could easily be described as running. There was a lot of this running going on. Runnning in and out, bringing stuff in from the truck. Running to fetch this tool or that. After about an hour, with the exception of the treadmill, and the bed, they had moved the rest of the furniture into the bathroom. The bathroom, which is less than half the size of the bedroom. I don’t know how they did it, but they did. The next thing they did was rearrange our living room to make room for the bed. Then, after taking the bed apart, they moved it into the living room. 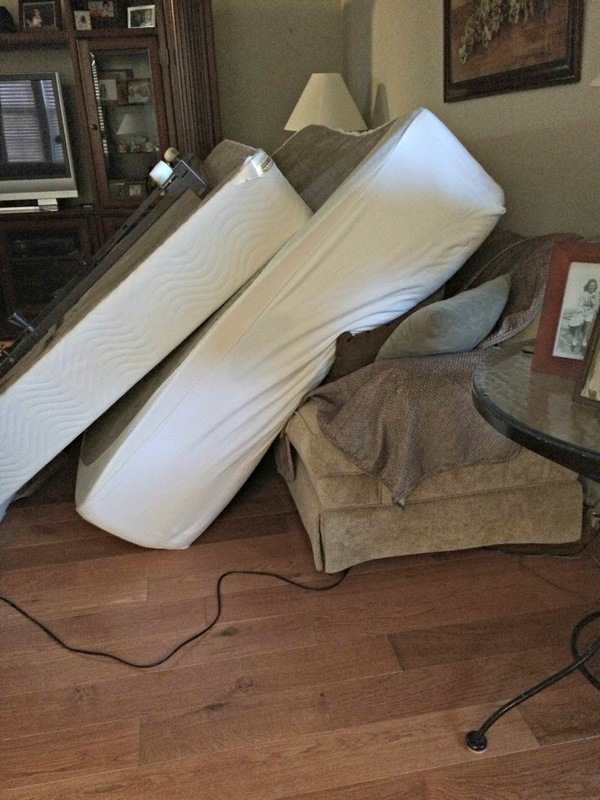 They laid the box spring, mattress and frame up against one the living room sofas. With Rico on my lap, I sat watching from the other living room sofa. It turned out to be the best seat in the house to observe what would turn out to be an interesting, to say the least, six hour production. The yelling started almost immediately. At first I thought that perhaps he had a hearing problem and that’s why he talked loudly. But then, as I started to tune into what he was saying, I realized that he was indeed yelling. The man was tall and lanky. His gait was quick but tilted. His worn and weathered appearance gave the impression of an older man. I realized later that thirty-five years of kicking down carpet had taken its toll. During a brief lull in the activity, I had an opportunity to start a conversation with the woman. “Is this a family affair?” I asked. She was a pretty woman, with bouncy curls and a pleasant smile. He was her husband, the young woman was her daughter, and the young man was their nephew. She told me that the regular crew wasn’t available that day, so the boss sent them to do this job. “Normally, they don’t send “him” out very often anymore to do these installs,” she said. According to his wife, he constantly complained that he couldn’t get good help anymore. She then told me that as the day goes on, he will probably get more testy. I couldn’t imagine how much more testy he could get. She was right though, as the day worn on, the yelling got louder and quite frankly more abusive. When he would call for a certain tool, all three of his “helpers” would literally jump and run. This behavior lasted throughout the whole day. A six hour onslaught of nasty, demanding, venomous attacks. Even though they might not recognize what effect this man’s assaults may have on them, I could tell by the behaviors of the woman, her daughter and nephew, it most certainly did. They finished up at around 2:00. The last thing they had to do was re-hang the closet and bathroom doors that they had taken off. This was the grand finale! As they left I looked closely at each of them. The nephew and daughter walked by, with their heads down and did not make eye contact. Needless to say I was not happy about this man coming into my house and behaving the way that he did. The carpet seems to be installed properly, so I have no complaints about that. But they were not very neat and left quite a mess. The painters are here today. They are a quiet pair. I've never had anything like that happen to me. Every worker person we've ever used has been polite and pleasant. I probably would have told him off myself. I’m not sure saying anything to the guy would have made a difference in his behavior. The family dynamic was certainly strange. wow. That type of negativity is so unprofessional. It would of made me nervous. A glass of wine would of helped. Having the dog on my lap was helpful. I was also knitting. That helped too. But, you’re right, the negativity was suffocating. I too would have been uncomfortable. I'm not sure I would have been quiet about it either. I'm not one that likes people in the house doing things like this or fixing things, they always make me uncomfortable and I'm always glad when they are done. I think there could be a story in the painters? I feel the same way, Betty. It makes me uncomfortable to have “strangers” in the house and can’t wait until they are gone. Yikes. I would have wanted to get out of the house rather than listen to that. You need to clear out the energy that that guy left behind. You know, normally we would have left the house. But with this crew, I did not feel comfortable leaving. I like what you said about clearing out the energy left behind. Perhaps a little lavender might help.